After their first release “Dub ina Midlands” on the first day of 2014, Koncrete Roots are back with more vibrations for all the nations.. The 2nd LP is a collection of 12 heavyweight tracks, among them a new version of the “classic” Inity Step ina jungle dubplate style and dubs of "Universal Dub" and "River Jordan. 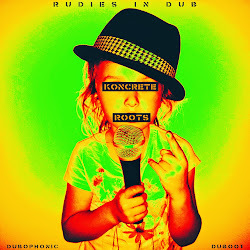 “Rudies in Dub” continues the vibes of “Dub ina Midlands”, offering strictly warrior style beats with a heavy dose of wall-shaking basslines, ingredients that became the acoustic trademark of Koncrete Roots. With this new release Koncrete Roots are dropping a bomb of consciousness in the Babylon world we live into. Ruff and tuff! This is the 2nd part of a special double release. The first part is the free EP "Rudies Dubplates" released two days ago, which can be downloaded from HERE!